I’m back after taking a few days off. . . .twelve consecutive days of posting definitely warrants that. 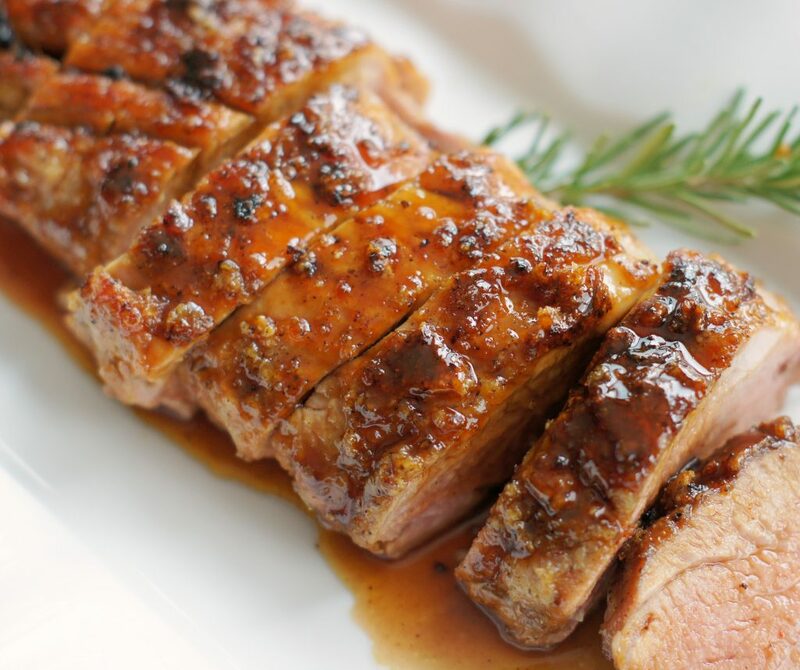 After 12 straight days of sugar madness, I’m sharing something you can actually serve for dinner This Maple-Glazed Pork Tenderloin is scrumptious. 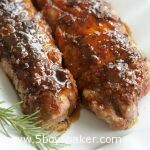 I have always loved pork tenderloin because it is always so tender but doesn’t take hours to cook. My all-time favorite is this sugar & spice tenderloin , but this maple-glazed tenderloin is a close second. Now the instructions look a little long and perhaps daunting, but don’t worry, it really is simple to make. It’s just a matter of basting several times. . . yum! If you’re looking for something to serve for a holiday dinner, this pork is perfect. Serve it with our family favorite rice or these delicious potatoes. . .a simple, delicious meal! Preheat the oven to 375 degrees F. Stir 1/4 cup maple syrup, molasses, vinegar, paprika and ginger together in a liquid measuring cup or bowl; set aside. Whisk cornstarch, sugar, salt, and black pepper in small bowl until combined. Transfer the cornstarch mixture to a rimmed baking sheet. Pat the pork tenderloins dry with paper towels, then roll in cornstarch mixture until evenly coated on all sides. Gently shake off the excess cornstarch (there will be extra cornstarch mixture, just throw it away). In a 12-inch nonstick skillet, heat the oil over medium-high heat. Place both tenderloins in the skillet, leaving at least 1 inch in between and cook until well browned on all sides, about 5-6 minutes total. Transfer the tenderloins to a lightly greased oven-proof wire rack set inside a cookie sheet. If you don't have a rack that size, the tenderloins can be placed on a lightly greased baking sheet - the coating on the undersides of the pork may be a bit soft after baking but will still be ok.
Pour off any excess grease/fat from the skillet and return it to medium heat. Add the syrup mixture to the skillet, scraping up any browned bits with a wooden spoon, and simmer the mixture until it is reduced slightly, 1-2 minutes. Transfer 1 1/2 tablespoons of the hot glaze to a small bowl and set aside. 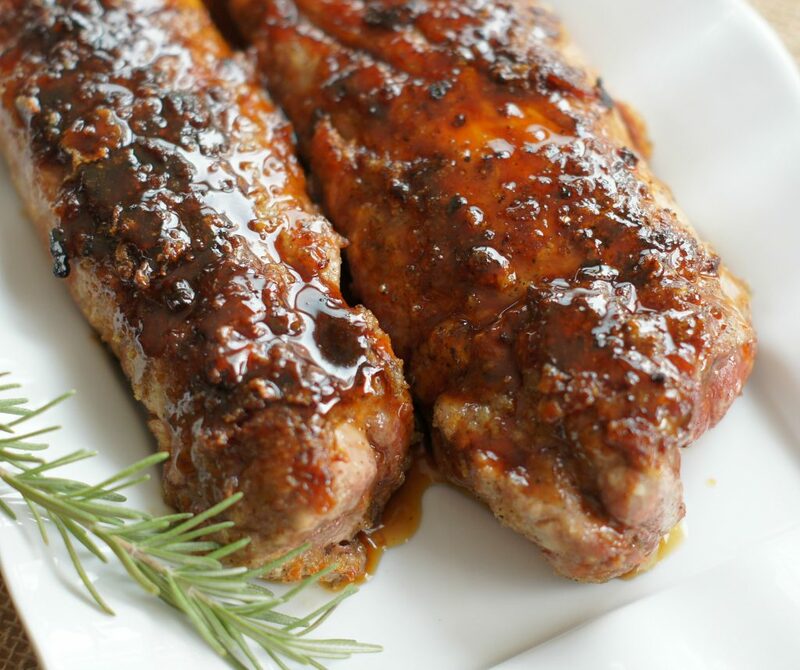 Using the remaining glaze, brush each tenderloin with approximately 1 tablespoon glaze. Roast the pork for about 15-20 minutes, until an instant-read thermometer inserted in thickest part of tenderloins registers 130 degrees. Brush each tenderloin with another tablespoon glaze and continue to roast another 4-6 minutes until an instant-read thermometer inserted in thickest part of tenderloins registers 135 to 140 degrees. Remove the baking sheet from the oven and brush the pork with the remaining glaze. Lightly cover the pork with foil and let rest for 5 minutes. While the tenderloins rest, stir the remaining 1/4 cup maple syrup into the reserved 1 1/2 tablespoons glaze (if glaze has thickened, just pop it in the microwave for a few seconds to heat it back up). Brush each tenderloin with the glaze and slice the pork and serve with any remaining glaze. Hi! All I had to do is read the list of INGREDIENTS to know that this is a print, pin, and create recipe! From a much older mommy to a younger, gorgeous mommy, Thank You, and Very Happy Holidays!!!! So sweet, thanks Teri! Hope you enjoy it and Happy Holidays to you!